Forget spiced lattes and the mountains of candy corn guaranteed to pile up in your cupboard this month — October is the perfect time to pop on a sweater and boots, head out, and #GetKind for your community. 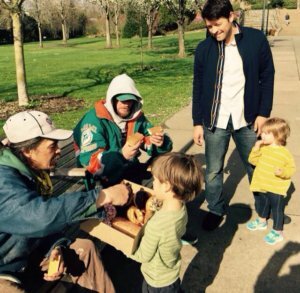 This month’s official #GetKind theme, Helping the Homeless, provides everyone an opportunity to do just that. And with an estimated 100 million people displaced worldwide, and some 1.6 billion people lacking adequate housing, according to a 2005 global survey, finding people who need that kindness is shockingly easy to do. Lend your voice. If you can, “get involved on a larger level to deal with the deeper social issues,” suggests Regional Representative Suzie. “Sweeping homelessness under the rug does not cure the issue, and many of us need to step up (lend your voice, attend meetings, etc) to try and find real, economically viable solutions.” Anxious about speaking out yourself? That’s okay! Write your local community leaders or provide whatever support you can to community campaigns looking to change things for the better. Know where your nearby shelters are located and have their information handy. If you see someone or talk to someone who needs a little assistance, you’ll be able to pass along the right info immediately. Donate! Drop off supplies or food to your community shelters or to local food or clothing drives when possible — even if it’s just a couple of cans of non-perishables, your act will make a difference. Care for homeless pets. “Unhoused people often prioritize feeding their pets over even themselves,” author CeliaSue Hecht wrote in a recent column for Vox. “It’s not that surprising — dogs are vital and necessary for providing comfort, protection, and companionship for women without homes, especially during this dangerous and isolated period of their lives.” Need some ideas? Check out what our 2014 Caught in the Act winners Lori and Shira Rich, of Riverside, California did and get inspired. Dismantle the stigma. Displaced individuals often have complex stories and myriad reasons that led to their current situation. 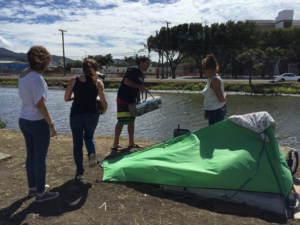 “Homelessness affects every community across the world and is a vastly understood situation,” writes Regional Events Officer Natalie. “Some are homeless due to mental illness, some are homeless even though they work two jobs, and some are homeless because of war or other instability in their region. 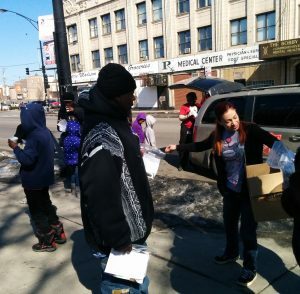 The why doesn’t matter nearly as much as showing kindness to those who have no permanent address.” Talk about the issue openly with those who will listen and encourage them to do the same — the more understanding our society becomes, the more likely they are to want to do something to make a difference. Need more ideas? Head over to our Kindness Files and get inspired. Changing the current state of homelessness around the world is a big task, but with a little bit of input and a whole lot of kindness from everyone, we know it’s possible. 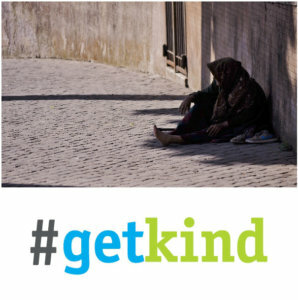 Let’s get out and #GetKind!